This year marks the 60th anniversary of the Cuban Revolution. Given its durability, revolutionaries should pay close attention to both its successes and failures. This is not always easy to do, given the deluge of propaganda we in North America have been exposed to over the last 60 years. The hatred of the U.S. ruling class stems from two factors: first, the centrality that Cuba played in the U.S. empire from 1898 to 1959; second, the Cuban Revolution as a “proof of concept” that revolution is possible in the Latin America. The second reason for the hatred of the U.S. ruling class is that the Cuban Revolution and Cuba today are a proof of concept—a demonstration that successful revolution is possible within the U.S. empire and that socialism is possible for the countries of Latin America. While the Cuban Revolution has been crippled by U.S. imperialism over the last 60 years, and while it had been distorted by the influence of Stalinism, it was a genuine socialist revolution made by the Cuban people, and Cuba remains to this day a workers’ state. For how much longer, though, is anyone’s guess. Steve Cushion is an activist worker and scholar from London. He worked as a bus driver in London for 20 years, earned a Ph.D. in Caribbean Labor History, and has been active in labor and socialist struggles his entire life. He enjoyed unprecedented access to Cuban historical archives and received the help of numerous Cuban and non-Cuban historians. The result is a profound re-telling of the Cuban Revolution that transforms prior misunderstanding of the process. What follows is a brief synopsis based on Cushion’s history. By the 1950s Cuba had developed a relatively large urban and rural working class, as Cushion points out. This working class was also highly unionized, with “the highest percentage of unionized workers in Latin America” (Cushion, p. 22). These workers were organized in a single labor confederation, the CTC (Confederacion de Trabajadores de Cuba), that was state sponsored and initially influenced by the PSP (Partido Socialista Popular), the Stalinist Communist Party of Cuba. The CTC developed in 1935 after a failed general strike led by an earlier national labor federation. The Cuban general strike of 1933. Another general strike followed in 1935. Batista, representing the interests of the U.S., used the military to defeat the 1935 general strike and ruled indirectly until 1940, when he won the presidential elections with the support of the PSP. The CTC and PSP declared a class truce during World War II and tried to enforce a no-strike and wage freeze deal on the workers. When Batista’s hand-picked successor ran in 1944 supported by the Stalinists, he lost (Cushion, p. 21). The no-strike and wage freeze deal was met with resistance by rank-and-file labor activists. Perhaps the most dramatic and successful resistance occurred in Guantanamo in 1943, where railroad workers were led by Trotskyists in a strike in which they demanded payment of a 15 percent wage increase that had already been agreed to by the railroad. The Trotskyists were members of the POR (Partido Obrero Revolucionario, the Revolutionary Workers Party in English), which since the 1930s had their center of activity among the workers and peasants of eastern Cuba. These workers later formed an important network of support for the July 26 Movement led by Fidel Castro (Cushion, p 33). The international context changed at the end of World War II, when the U.S. adopted new anti-communist policies both at home and in its empire. The Communists were purged from the CTC national leadership in 1947, and Eusebio Mujal, a loyal Batista supporter with connections to both the AFL and the CIA, became the general secretary of the CTC. After the March 1952 coup in which Batista took power permanently, Mujal became an important supporter of the dictatorship. In addition to the political changes brought about in the 1950s by the Batista dictatorship and the pro-capitalist policies of the Mujal trade-union leadership, the Cuban working class experienced important economic changes. In the 1950s, sugar accounted for 80% of Cuba’s exports (Cushion, p. 43). Sugar production produced enormous profits for the U.S.; for instance, “between 1948 and 1955, $637 million in profits from sugar alone were repatriated to the U.S.” (Cushion, p. 45), and closely tied the Cuban ruling class to U.S. capitalism. When the price of sugar on the world market collapsed in 1952 because of overproduction, Cuba experienced an economic crisis. The still young United Nations responded by calling an international conference of sugar producing nations in London. The London Sugar Agreement of 1953 established quotas for each nation in an effort to maintain prices. Not all nations participated, however, and individual countries had an incentive to break the quota to increase their own sales on the world market; the agreement was a failure and sugar prices stayed low. The U.S. and Cuban capitalists responded with an effort to increase their profits on the backs of the workers by increasing productivity. Specifically, they sought to increase mechanization in harvesting, processing, and transporting sugar, thereby reducing both the number of workers needed and their labor costs. They also sought to break the unions and reduce wages and benefits. It was in the context of the economic crisis and the war on the working class that Batista seized power a second time in 1952. On July 26, 1953, Fidel Castro and 135 others seized the Moncada army barracks with the aim of starting a mass insurrection against Batista. The attempt failed and Castro and others were tried and convicted. Castro’s courtroom defense, “History will absolve me,” was a stirring critique of the dictatorship. At the same time, the PSP turned away from its policy of peaceful coexistence with the capitalists and support for the government and turned “toward the working class” (Cushion, p. 113) and a strategy of mass action, especially strikes and strike support. A turning point in the war on the working class took place in 1955 when Batista and the ruling elite aggressively imposed their program of wage cuts and mechanization. Cushion details the resulting wave of strikes in Chapter 3. He highlights the brutal nature of the attacks, along with the important role of women and students in the strikes. In 1955 there were 13 major strikes outside the sugar industry and 14 major strikes within the sugar industry along with numerous other smaller strikes and labor actions. In addition, a massive amnesty campaign succeeded in freeing Castro and other participants in the attack in 1955. Castro and his followers regrouped in exile, forming the July 26th Movement (Movimiento Revolucionario 26 de julio). The strike wave met with both successes and failures, with both the PSP and the July 26th Movement gaining adherents. Their involvement in the mass struggles also placed the two groups in closer proximity, with the PSP slowly coming to realize the significance of Castro’s group as a potential ally or competitor. After a number of defeats in the 1955-56 strike wave, workers took stock and re-assessed their strategies and tactics. Workers adapted in two ways. First, they started to combine strikes with industrial sabotage. Second, they formed clandestine cell structures within their unions and communities. This clandestine cell structure later formed the basis for the July 26th Movement’s workers’ section [sección obrera]. Meanwhile, militants and leaders in the PSP moved toward embracing the general strike as a way to bring down the dictatorship. Into this pre-revolutionary crisis stepped Fidel Castro, who arrived with other militants of the July 26th Movement on the boat Granma near the end of November 1956. Supported by workers who helped prepare the way by stockpiling food and arms, as well as engaging in supporting strikes, Castro and his militants set up bases in the Sierra Maestra, in Eastern Cuba. The Batista regime responded with a reign of terror against workers and domestic political opponents, as Cushion details in Chapter 5. Activists and political leaders of all strips were arrested, tortured, and sometimes killed, constitutional rights were suspended, and press censorship was enforced. This did not curtail the activism, however, and 1957 saw another wave of strikes, albeit mainly defensive in nature. At the same time, activists in local areas from both the PSP and the July 26th Movement, along with activists from other political tendencies came together in local areas and cooperated with one another, a kind of political convergence at the base. The most successful political action against the dictatorship was a general strike in August 1957 (described in Chapter 6). The August general strike in eastern Cuba started when Frank Pais, the leader of the July 26th Movement underground in Santiago, was captured and executed at the end of July. The strike is often described as spontaneous, a term Cushion notes is often used by historians when they don’t know who organized an event. Cushion shows that the strike was organized by the network of militant trade-union activists who were “able to react quickly and seize an opportunity without requiring orders to do so” (Cushion, p. 157). The strike did not spread beyond eastern Cuba but did paralyze a number of towns and factories in the east. The strike was most successful in places where the July 26th Movement and the PSP cooperated with one another and where there were clandestine workers’ cells. Women played a crucial role in this strike, as did a number of Trotskyists who had joined the July 26th Movement. The August 1957 strike led to increased cooperation at the base between the July 26th Movement and the PSP. The leadership of the two organizations drew different conclusions from the strike. The PSP saw the strike as evidence of the strength of their mass-struggle approach and emphasized a 20% wage increase as a crucial part of their program. The July 26th Movement, on the other hand, felt that the dictatorship was on the verge of collapse, and that a single push from a general strike combined with a guerrilla offensive would end the dictatorship. The July 26th Movement called for a general strike on April 9, 1958. Workers had not prepared for the strike—the call came as a surprise to most workers but not the government, who was expecting a strike at any time. While the strike activities in Havana and outside of the capital (see Cushion, pp. 167-168 for a list of the strikes outside of the capital) were impressive, the July 26th Movement had not done the hard work and careful preparation needed for success. The strike ended in defeat and was considered a disaster by both the PSP and the July 26th Movement. The failure of the strike produced a tactical convergence between the July 26th Movement and the PSP. Castro and his leadership team realized the importance of careful preparation, economic demands, and collaboration with the PSP. The PSP realized the importance of insurrection (of which the armed struggle in the mountains, the focos, was an important part), armed support for the strikers, and of cooperation with the July 26th Movement, which they now viewed as the leadership of the revolutionary struggle. While the April 9 general strike had failed, it laid the foundation for the defeat of Batista and the success of the revolution. Chapter 7 details the rapid developments that took place after the failed April 9, 1958, strike. These developments produced the defeat of Batista at the end of the year. The guerrillas adopted a policy of leniency and fair treatment to captured enemy soldiers (in contrast to the extreme brutality and torture used by Batista’s troops). This encouraged many of the troops to surrender or change sides. The July 26th Movement and the PSP decided to form a united front of all workers organizations and created a joint organization, the FONU (Frente Obrero Unido Nacional/United National Workers Front, in English). FONU very quickly started organizing united-front groups of workers in all areas of the country and in all industries. FONU planned for a national strike to start in January 1959, in conjunction with the start of the sugar harvest. In preparation for the strike, FONU organized two democratic national workers conferences (in July 26th Movement controlled territory) of rank-and-file militants. As a consequence of these national workers conferences (which Cushion argues have been generally ignored by historians), FONU undermined the last vestiges of authority of the pro-capitalist labor movement. Equally important, the July 26th Movement gained enormous status as the leadership of the working class. While the FONU never really existed as a single united organization at the national level (there simply was not enough time to merge the national leadership of the two groups), it was a potent symbol and, more importantly, there were united-front actions among workers in various industries, cities, and regions. Chapter 7 describes the end of the Batista dictatorship, which happened quickly. Batista was not able to maintain the conditions for normal economic activity, and the economy ground to a halt. The capitalist class abandoned him, hoping to replace him with someone who could drive down wages and defeat the July 26th Movement. In May 1958, Batista’s forces launched an offensive against the guerrillas; the offensive failed completely. By August, two columns of guerrilla forces were marching west. The July 26th Movement seized Santiago de Cuba on New Year’s Day when they heard the news that Batista had fled the country. The revolutionary process was now at a crucial turning point. A number of capitalist politicians sought to seize control of the government in a coup. Castro addressed the country by radio from Santiago, calling for the start of the general strike. The strike paralyzed the country, prevented any pro-capitalist coup, and guaranteed the victory of the July 26th Movement. Castro himself acknowledged the importance of the general strike, which “was decisive in delivering the fortresses of the capital of the republic, in defeating the final maneuvers of the enemies of the people, and in giving all power to the revolution” (Cushion, p. 198). Cushion ends his analysis with Chapter 8, on the first year of the Cuban Revolution, and with a final concluding chapter. The united front between the PSP and the July 26th Movement broke down almost immediately, with internal divisions and realignments in both groups. Eventually, both groups split, and then the left wing of both groups merged to form the Cuban Communist Party. The conclusion is especially worth reading, as it provides a succinct summary of the historical lessons of the Cuban Revolution. The Cuban Revolution has generally been understood, or rather misunderstood, on the basis of two myths. The first is the myth of the foco, the small band of revolutionaries fighting in the mountains that makes the revolution. The other is the myth of the middle class in revolt, bringing down the hated dictator Batista, only to have their democratic revolution highjacked by Castro and the radicals. Cushion alludes to both of these portrayals of the revolution at the very beginning of his book in the form of two contrasting movies: Che, a movie about the heroic revolutionaries fighting in the mountains, and Cuidad en Rojo, a Cuban film about the urban, middle-class opposition to Batista in the final days of the dictatorship. Cushion’s invaluable work shows that it was the working class, led by the vanguard MR 26-7 and Fidel Castro, that made the revolution. The isolated focos fighting in the mountains, as Cushion shows, could not have survived without the active support of networks of urban and rural workers who supplied them with food, weapons, logistical support, and information. In many respects, the Cuban Revolution followed the basic pattern of the Russian Revolution, although more by accident than because of a grounding in Marxist theory. The portrayal of the revolution as a consequence of heroic revolutionaries fighting in the mountains is in part a creation myth created after the fact, just as the portrayal of the revolution as a middle-class struggle (many in the middle class did oppose Batista, especially at the very end) hijacked by Castro is also a myth. Cushion does not address the foco strategy of guerrilla warfare but his historical research is directly relevant to questions of revolutionary strategy. Cushion’s pathbreaking historical research should put to rest any question about how revolutions are made. Revolutions are not made by small groups, but by the working-class masses. These masses need a revolutionary vanguard, but this vanguard is itself made up of the most advanced members of the working class. Armed struggle may be an important or necessary tactic, but it is the use of strikes and protests, including the general strike, which will ultimately bring about a mass insurrection. The way ahead, for revolutionaries everywhere, is what is generally thought of as the Leninist strategy. Marx, Engels, Lenin, and Trotsky all envisioned socialist revolution as a world revolution, starting perhaps in one or a few countries and then spreading in both the capitalist core and the capitalist periphery. None of them believed that socialism could survive in one country, let alone a country in the underdeveloped and neo-colonial periphery of the capitalist world system. The abominable Stalinist doctrine of “socialism in one country” made a virtue of a grim necessity and was used to justify the reactionary policies of the Soviet bureaucracy. The leaders of the Cuban Revolution knew better. 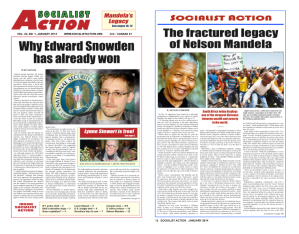 In an article in the January 2019 issue of Monthly Review, journalist Ron Augustin has offered a timely analysis of the Cuban Revolution and the problem of socialism in one country. (4) Augustin focuses on the views of Che Guevara and other members of the Cuban revolutionary leadership. Guevara knew that socialism in one country replaced “internationalism with chauvinism” (Augustin, p. 42). In the early years, Cuban leaders also believed that the development of socialism in Cuba depended on socialist revolutions happening elsewhere in Latin America (Augustin, p. 43). Given the weakness of the Cuban state in the face of the imperialist juggernaut, Cuba did not have a lot of room to maneuver. While Cuba gave extensive support to revolutionaries throughout Latin America and Africa, especially before the demise of the Soviet Union, the main policy—at least in the past—was to convince by example, or as the Cubans say, to “send out moral missiles” (Augustin, p. 43). The fact remains that maintaining and transforming the country’s socialist development does not depend on internal conditions alone. As long as Cuba has to go against the tide of present-day international realities, its process of socialist development will continue to be an extremely complex and difficult one. Thus, the question is not so much whether the Cuban Revolution can survive but whether its isolation in a capitalist world will be broken by other social revolutions. Instead of making that tourist trip “before it’s too late,” it might be good to ask ourselves how we can help create two, three, many Cubas (Augustin, p. 47). (1) See the speech by Trump National Security advisor John Bolton on November 1, 2018 at a forum at Miami Dade College. During the speech Bolton announced new sanctions against all three countries. (2) See “The True Flag: Theodore Roosevelt, Mark Twain, and the Birth of American Empire,” by Stephen Kinzer. (New York: Henry Holt and Comp., 2017). (3) “Revolution in the Revolution,” by Regis Debray and Bobbye Ortiz. (New York and London: Verso, 2017.) Originally published in the U.S. by Grove Press in 1967. (4) “Cuba, Che Guevara, and the Problem of “Socialism in One Country,” by Ron Augustin. Monthly Review, January 2019, pp. 37-48.